Some drainage work was done by Messrs Karl Falck outside Krematorium IV from 26th to 3lst May 1943 [Photo O] and by “Triton” from 2nd to 9th June 1943 [Photo P]. Nothing is known about the drainage work for Krematorium V.
In the deed of transfer by which Krematorium IV was handed over to the camp administration [Photo Q] (that for Krematorium V has not been found) the Bauleitung mention only FIVE firms as having participated in its construction: Industrie-Bau AG, Riedel & Son, Topf & Sons, Josef Kluge and Robert Koehler. The contribution of Konrad Segnitz is not mentioned, as it was too theoretical and the participation of Karl Falck and “Triton” was too insignificant. On the other hand, the omission of Huta is doubly incomprehensible. First. it is difficult to understand why the Bauleitung did not mention the Huta participation, which was as great as that of Riedel & Son. Second, the explanatory report that formed part of the handover documents for Krematorium IV [Photo R] states that work started in November 1942, whereas according to a Huta invoice [Photo D] work was started by them on 23rd September 1942, MORE THAN A MONTH EARLIER. At present neither the omission nor the discrepancy in the dates can be explained. 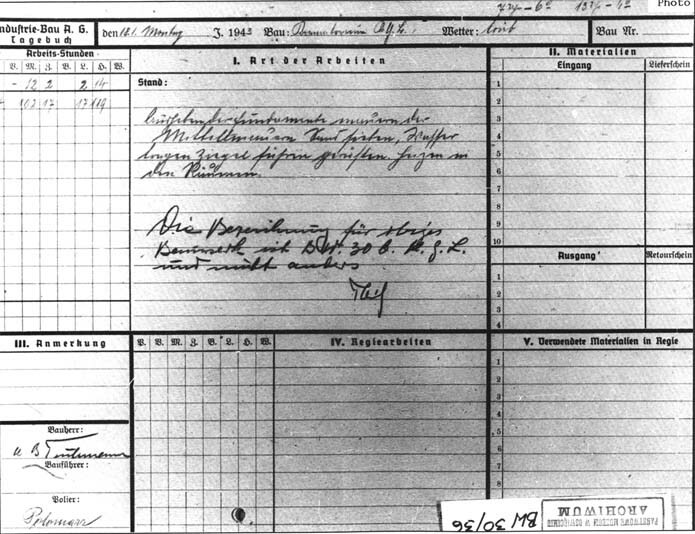 “Die Industrie-Bau AG timesheet for work done on Krematorium IV on 18th January 1943.” A note has been added by Teichmann, a Bauleitung civlian employee, concerning the proper designation of the worksite: “Die Bezeichnung für obiges Bauwerk ist BW 30b KGL, und nicht anders / The designationof the above worksite is BW 30b POW camp and nothing else” The Bauleitung were struggling to get their official worksite designations and Krematorium numbering accepted, while the civilians working on the four Krematorien found it more logical to simply number them one to four rather than two to five.